mine-sweeper-auto.el is a fun add-on for mine-sweeper.el by Toshihide Shimayama. mine-sweeper-auto.el gets the computer do the safe mechanical parts of the mine sweeping game. It goes progressively, rather than one big solution, working around edges and holes. mine-sweeper-auto.el is free software (free as in freedom), published under the terms of the GNU General Public License (v3 or up). The sig is a Gnu PG ascii armoured signature for mine-sweeper-auto.el, generated from my key. The following diff for mine-sweeper.el is recommended. The first part switch-to-buffer is important as otherwise M-x mine-sweeper clobbers the current buffer. 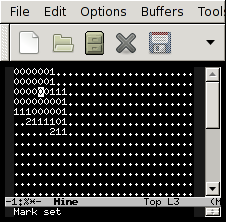 See also the Emacs wiki MineSweeper page. This page Copyright 2005, 2007, 2009, 2010, 2011, 2013, 2014, 2015, 2016, 2017 Kevin Ryde, except for the GPLv3 logo which is Copyright Free Software Foundation and used here in accordance with its terms.